That deaf dogs are aggressive and untrainable is a myth perpetuated by some for many years. Even in their short time, Spotted Dog has already witnessed a change in thinking among some breeders. It would appear that few are immune to the heartwarming message that also serves as their credo: "Deaf dogs hear with their hearts, not their ears". With a background in both dog training and evaluation on behalf of the AKC and Therapy Dogs International, Spotted Dog founder Ariel O’Brien knows dogs. She knows that, even if one of their five senses is underdeveloped, it doesn’t mean they aren’t capable of love. O’Brien is leading a crusade on behalf of hearing-impaired Dalmatians. She believes that life should be cherished and that puppies, regardless of ability, deserve the chance to live long and fulfilling lives. Life is challenging enough without having the deck stacked against you. As O’Brien has seen time and time again, not only can these Dalmatians lead normal, healthy and happy lives, they readily take to therapy training and can enrich the lives of people through service. In fact, one of Spotted Dog’s Dals recently went on to become the permanent live-in companion for a 7-1/2-year-old boy with Down’s syndrome. At present, they do not have a dedicated facility, relying instead upon a network of foster parents. Thus far, they have expanded their reach into Ohio, Maryland, Pennsylvania, Tennessee, Texas and Virginia. So strongly do they support their foster families, they go the extra mile and provide funds to cover veterinary expenses. Additionally, Spotted Dog trains all of their rescued pups prior to adoption by their forever families. They are continuously hunting for new volunteers interested in helping with the cause. 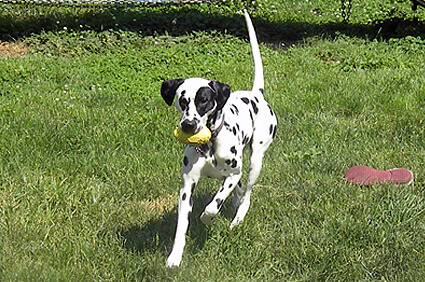 Spotted Dog actively supports a statewide Therapy and Humane Education Program, stemming from the belief that proper training, knowledge and activity are all key components of creating a great home for Dalmatians, especially those with hearing deficits. Their volunteers assist in training and resolving behavioral issues, as oftentimes one-on-one counseling can mean the difference between a deaf Dal remaining at home and being sent away to a shelter. Spotted Dog’s leaders actively seek out new ways to enhance the lives of their wards. Just recently, they were able to negotiate a one-year pass to a private dog park for all of their rescues. For the next twelve months, their pups will enjoy acres of land for cavorting and a swimming pool to cool off afterwards, all at no charge! We’d like to convey our heartfelt thanks to all of our readers and customers who, through their personal donations and continued business, makes this and every grant possible. Each one of you has directly helped Spotted Dog to continue its vital work to make the world a better place for a fortunate few hearing-impaired Dalmatians. Remember, every time you order from Life’s Abundance, a portion of the profits goes directly to our foundation. If you would like to make an additional contribution to help ensure that deserving rescues like Spotted Dog Dalmatian Rescue continue to receive much-needed financial support, please call us toll-free at 877-387-4564 … an agent will be happy to take your donation. Any amount helps, more than you can imagine. Who says a few dollars doesn’t go a long way? When hundreds or thousands of people give just $5 amazing things can happen. I know this because in April of 2012 my mom was diagnosed with stage 2 lung cancer. My friends were nice enough to hold a beef and beer event to raise money for her. Since then we have wanted to pay it forward. In the last year we have realized there are so many more ways to raise money inexpensively. We are here to help, if you are interested of course. I am looking for people, schools, churches, organizations, sports teams etc, in need of raising money. I run a fundraising business and have alot of profitable options to help you raise money. Please email me if interested!